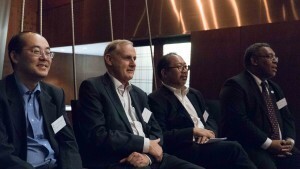 Left to right: Senior APEC Analyst Carlos Kuriyama, APEC Secretariat Executive Director Alan Bollard, Pacific Economic Cooperation Council Secretary General Eduardo Pedrosa and the PNG Government Ambassador to APEC Ivan Pomelau. Leading Asia-Pacific Economic Cooperation (APEC) experts say Papua New Guinea stands to benefit from being in the global spotlight when it hosts the APEC forum in 2018, including an anticipated boost to investment, tourism and trade. A forum was held last week to raise awareness of the opportunities that APEC would present in 2018, following the APEC Policy Development Dialogue between Papua New Guinea, Australia and senior APEC officials from across the region. 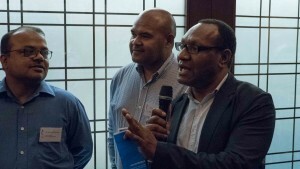 The forum was hosted by the Australian High Commission and the Papua New Guinea APEC Secretariat through the Pacific Leadership and Governance Precinct. The Precinct is a partnership between Papua New Guinea and Australia to develop future leaders and drive public policy debate. Australia is supporting Papua New Guinea in its policy preparations for APEC, including the provision of training for officials to develop, advocate and implement policies, and the establishment of the APEC Study Centre at the National Research Institute. Dr Alan Bollard, Executive Director of the APEC Secretariat based in Singapore, said hosting APEC was a big task and Papua New Guinea was advancing in its preparations for the event. Attendants, including National Research Institute Director Dr Charles Yala, had the opportunity to put questions to the APEC experts. “APEC is trying to integrate the Asia-Pacific region economically by cutting trade barriers and keeping the spirit of trade, investments, people movement and economic integration alive. “By hosting APEC Papua New Guinea will get a lot of exposure internationally from people that didn’t know much about the country. “People will better understand the sorts of trade, tourism and investment opportunities that exist here,” Dr Bollard said. Rod Hilton, Minister Counsellor at the Australian High Commission, said hosting APEC is a privilege and an exciting prospect for the country. “APEC offers the unrivalled opportunity of bringing the attention of world leaders to Papua New Guinea,” Mr Hilton said. “PNG will be able to showcase its culture, people, beauty, economy and opportunities to the world. 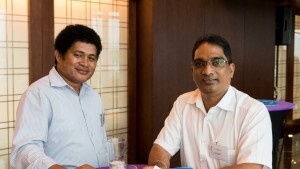 Precinct partners were amongst the attendants at the event, including Vele Ravugamini, Executive Manager at the Department of Personnel Management, and Ponnusamy Manohar, Deputy Dean at the UPNG School of Business and Public Policy. Papua New Guinea Government Ambassador to APEC, Ivan Pomaleu, said a lot of work had gone in to preparing for the APEC Policy Dialogue. “This has been a very useful exchange and we are a taking the commentary and critical analysis of the APEC Secretariat on board,” Mr Pomaleu said. Pacific Economic Cooperation Council Secretary General Eduardo Pedrosa and Senior APEC Analyst Carlos Kuriyama also attended the forum.